Spent last Mon-Wed with my running shoes locked in the truck as we ventured even farther away from home on the Family Vacation. If the drive to Lisle was “Griswold-ish”, than our arrival at the Wisconsin Dells waterpark-extravaganza was our symbolic “Wally World”. 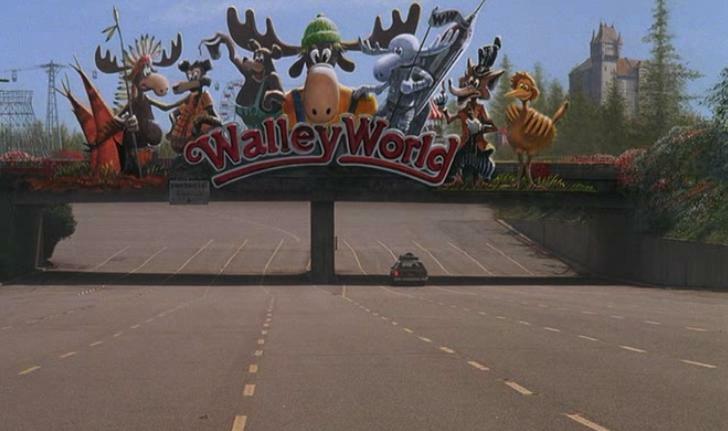 All that was missing was John Candy meeting us at the front gate trying to tell us that the Dells were closed. We spent the days following the national meet giving the kids one last dose of ‘summer vacation’, then began the long haul home (900 miles) Wednesday morning. Arrived back here on Thursday afternoon, finally got a little exercise as I hit the pool for 45 minutes, then about 30 minutes on the trail with the junior-high cross-country team (oldest daughter has taken the leap….). 60 more minutes in the pool on Friday before taking Saturday off to prepare for (drumroll please)…. the GPTC Track Pentathlon! Turning back the clock, this event is historically important because this was where I pulled my hamstring in 2010, leading me to starting to write this blog (which historically speaking currently polls a close second to the Dead Sea Scrolls in literary significance). The pentathlon originally was five events (3000-800-200-400-1500) all done by one runner. The times were then age graded to level the playing field, with the overall winner being the person with the highest age graded ‘percentage’. Well, in 2010 I ran a decent 3000, cruised the 800, then instead of running a full 200m my bum hamstring opted for the abbreviated 13m dash. Pop, the track season was over, and I ended up hitting the pool harder than ever before – an aqua disciple was born…. I was actually looking forward to the 5300m challenge. In my mind I had been through every possible way to skin this cat – go a little easy on each event to conserve energy, or get after it every event and hope to survive. I guess I went with the latter, but as the event progressed it was fun changing the strategy on the fly to try to match our competition. The age-grading was the ultimate equalizer – as it turned out being the race leader and getting all the applause didn’t necessarily mean you were “winning”..
Set out on the 3000m shooting for something close to 9:00, hoping it would not be as uncomfortable as my 8:58 PR I ran indoors in Bloomington. I went through 1000m on pace, then gradually began giving up a couple of seconds here and there over the next handful of laps. Finished first in 9:06.80 – the good news was the longest race was over, the bad news was that despite scoring over 87 percentage “points” I got smoked by 50 year Doreen McCoubrie whose time scored her almost 91 points. Carl ran a solid 200m in the next event, leaving us about 3 points behind Team Athena. I took the track again for the 1500m – this time hoping to cruise around 68-70 second laps – something a little under 4:20. I got out pretty well, and started banging out 67 second laps. Finished pretty strong, crossed the line in 4:13.91, a pleasant surprise. Pleased with not only the time, but how easy it felt – heck, the time was only about 4 seconds slower than my winning time last weekend, and this time I had run a hard 3000m less than 2 hours prior. I think if push came to shove I easily could have gone under 4:10 – I ran completely alone, and I was trying to avoid a max-effort race since I still had one to go. All that being said, Ms McCoubrie dropped a 5:07 behind me, which made my (what I though to be impressive) 88.93 look small next to her 90.06. Foiled again! Wayne ran a great 100m race, and made up the deficit we had been facing all meet. The 800m was the last event, and after doing the math on what I predicted the team in second place would run, I figured I needed to run around 2:10 or so to seal the deal. I thought based on how the 1500m went that would be pretty doable, so I set out to run a 64 second quarter then hopefully bring it home strong. As with my other two races I ran alone start to finish – through the 200 in 29 (yikes), settled down for a 62 second first lap, then cruised to 600 fairly easily. 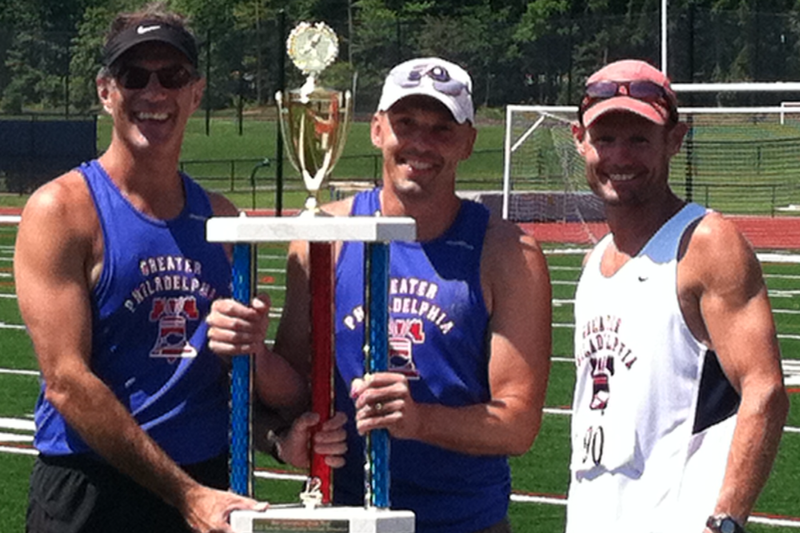 Had no problem finishing, broke the tape in 2:03.8 for an 88.28 percentage score, enough to take the team title. Again – 2:03 is only a handful of seconds slower than last week, this time coming off of a 3000m and a 1500m race. So, to make a short story long, we took the title, cash prize, and quite possibly the largest trophy this side of the Stanley Cup. I ran three races, and almost seemed to get stronger as the day got longer. To finish with a 2:03.8 that could have probably been faster was a great way to cap off a fun meet. Maybe all the base work I’ve done this summer has paid off. Maybe I’ve been selling myself short this track season. These results certainly make my nationals times look average. Oh well, hopefully I can take this effort and build on it during the upcoming road season. Whatever the case, it was good to finish the track season on an up note, and I’ll look forward to participating in this even next year to defend our title. 2012 Track Pentathlon Team Champions! This entry was posted in Competitive Races, HydroWorx Exercise Pool, Masters Track, Running, Track Sprints, Uncategorized and tagged 2012 Track Pentathlon Team Champions, Cross Country Team, GPTC Track Pentathlon, HydroWorx Pool, Pentathon, underwater running. Bookmark the permalink. I’m not sure which was more impressive; the times you ran without the competition or your math skills to reverse engineer what you needed to run for the ginormous trophy! 😉 Great to meet up in person and it was a treat for me and Tyler to watch your 800m. Although I don’t think I’ll help the team much, I think I’ll join GPTC when I renew my USATF membership at the end of year. Seems like a fun and supportive bunch. Think about that Philly Marathon: few other races to compete with at that time of the year although you never know how cold race day could be! Thought you were already a member! It is definitely a good group of people, and will certainly make your running and racing experiences better if you get involved. Good to see you out there, thanks for the techno-advice. I don’t do well with problems I can’t hit with a hammer, and that iCloud was proving to be very elusive…. Nick, i’ve been following for a while and believe the day you put in Sunday might top this year’s list of impressive performances. Congrats on the times at all 3 distances! You’ve got a few big fans in south jersey at the Moorestown distance club. In it’s own sort of way I feel the same about Sunday’s meet. If nothing else, I was very pleased with how each one felt, which I tend to overlook in the face of the “bottom line” time. Thinking of entering the 3000m (indoor) or 5000m (outdoors) at national meets just to get in a good ‘warmup’ before lacing it up for my normal events since I seem to perform better with a couple laps under my belt. Maybe we’ll cross paths on the roads, South Jersey is definitely drivable, which makes it doable!